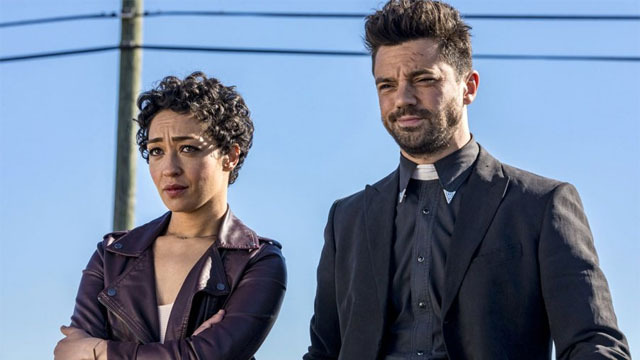 Last year, AMC renewed Preacher for a fourth season despite the third season’s lackluster ratings. Garth Ennis and Steve Dillon’s cult classic comic book series was a passion project for Seth Rogen and his producing partner, Evan Goldberg. However, Rogen has confirmed that the upcoming season of Preacher will be its final run. In a post on his twitter account, Rogen shared an apocalyptic teaser that revealed the end of the show. It also stated that Preacher season 4 will premiere on Sunday, August 4. While the first three seasons have adapted Ennis and Dillon’s story at a very relaxed rate, the final season has a lot of ground to cover. That means the series’ arc will have to be truncated to get to the ending of the comic. The show follows Jesse Custer (Dominic Cooper), a small town preacher who was empowered with the word of God. It happened when he was joined with Genesis, the offspring of a demon and an angel. With few exceptions, everyone in creation has to obey Jesse’s command when he uses the word of God. Jesse’s girlfriend Tulip (Ruth Negga) and his vampire friend, Cassidy (Joseph Gilgun) joined Jesse on an extended road trip to literally find God. The Almighty has abandoned Heaven, and he seems to be avoiding Jesse in particular. In the third season, Jesse made an intractable enemy of Herr Starr, the leader of a secret organization known as The Grail. Starr had Cassidy kidnapped because of his connection to Jesse. Meanwhile, the Saint of Killers joined forces with Eugene to get their revenge on Jesse. That left Adolf Hitler in charge of Hell. What are you hoping to see in Preacher‘s final season? Let us know in the comment section below!